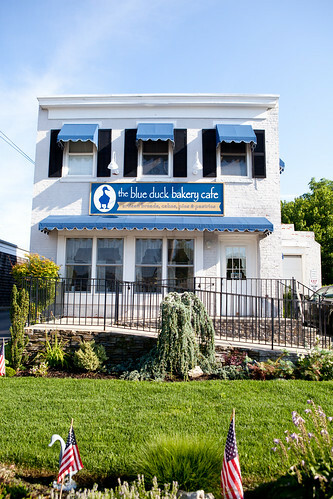 Continuing on my road trip around the Hamptons area, we stopped by Blue Duck Bakery Cafe, a 13-year old establishment cranking out, in my humble opinion, one of the best artisan breads around New York. 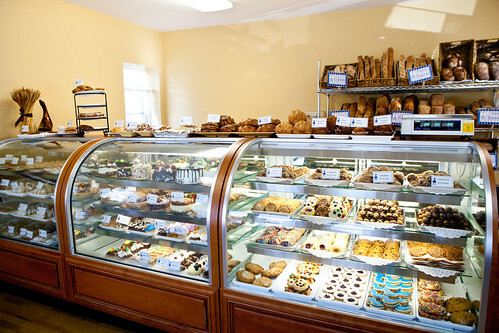 I met with the friendly co-owners, also husband and wife, Keith and Nancy to give me a nickel tour of their bakery. 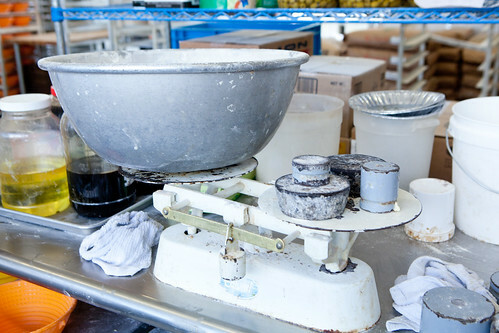 This is a family business that most of their adult children are responsible for parts of this business, from the baking to the business/accounting aspect. 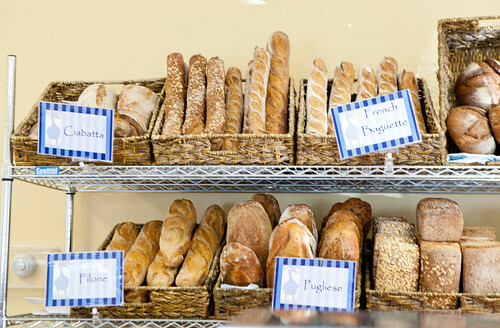 Most of their business is wholesale, selling to most Hamptons restaurants and a few Manhattan restaurants while they do have two retail locations on each fork of Long Island (Southold and Southampton). As Keith guided me through their medium-sized production area, with long white coats (think a doctor/scientist’s lab coat) with hats on to keep everything sanitary, everything is efficiently run and it’s always buzzing with activity. 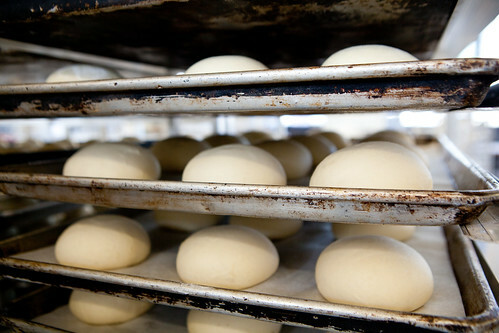 There’s one section devoted to weighing and mixing the flour and other ingredients to make a specific bread dough for the day; another is cutting and letting the dough rest and proof; one area is shaping into boules; many refrigerators to store their specific bread starters; a larger area for baking, and one corner is to take care of pastries. 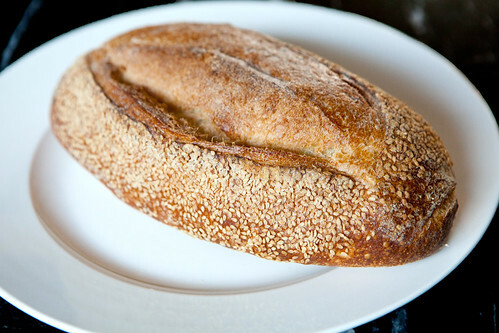 I felt like a wide eyed child, fascinated by what everyone was doing and how a raw blob of dough (with live yeasts) can turn into beautiful, delicious loaves of bread. 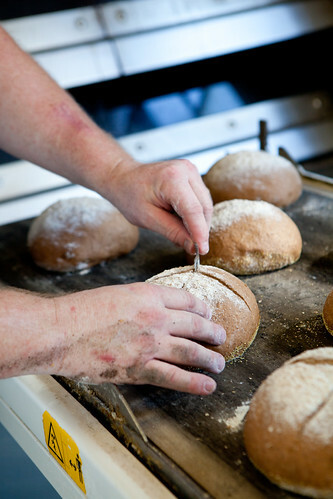 The most interesting area to watch is where the baker and the huge, Italian custom made oven is. 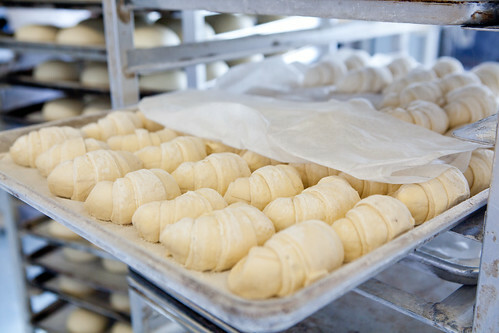 You would encounter tall racks full of proofed breads on sheet pans, see the appointed baker to move back and forth loading up the sheets onto the conveyor belt and at the push of a button, see the belt roll the sheets into the hot oven. 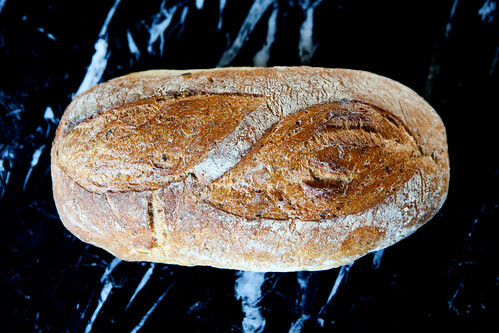 I’m mesmerized as to how this baker could slash proofed bread so easily (seen above). Whenever I attempt slashing my own bread, it’s never right. The above video clips are some things I’m able to record from my camera. 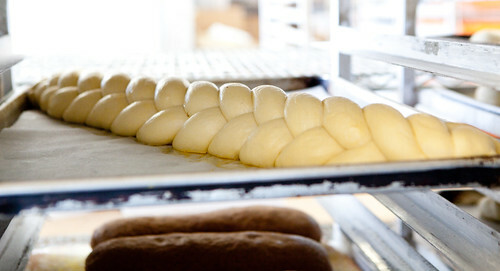 The one on the left is where a machine rolls bread dough as gentle as human hands would but a lot faster and the right is where the freshly baked sandwich rolls of literally rolls out from the oven. Very cool stuff. Nancy took over this other half of the visit by being the most gracious host and presented us a huge spread of food, all based on the breads they bake. 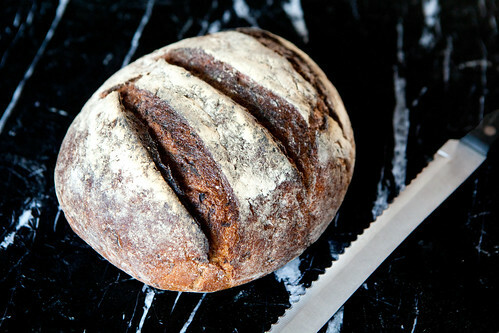 Ranging from trying the bread alone (Swedish limpa rye, pumpernickel, herbs de provence, chocolate, and so much more!) 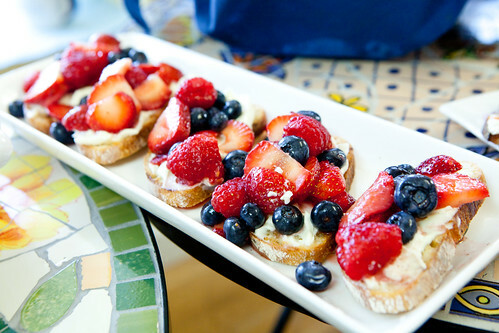 to the open-faced sandwiches of sweet (grilled baguette with mascarpone cheese, fresh berries drizzled with light honey and baguette with cream cheese and smoked salmon and capers sandwiches). 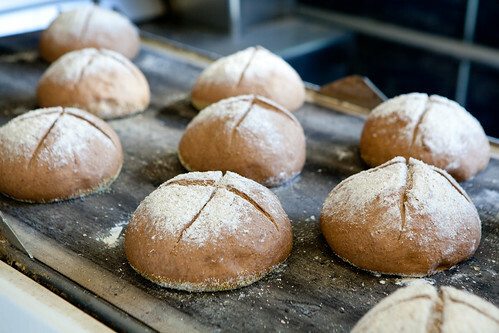 We were floating in bread heaven. 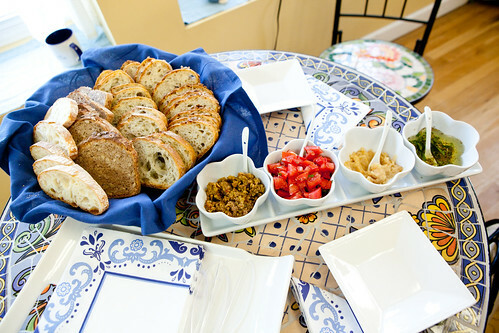 Everything was flavorful and even the sandwiches spotlighted the amazing bread. Before we headed out, I wanted to try a few sweets. 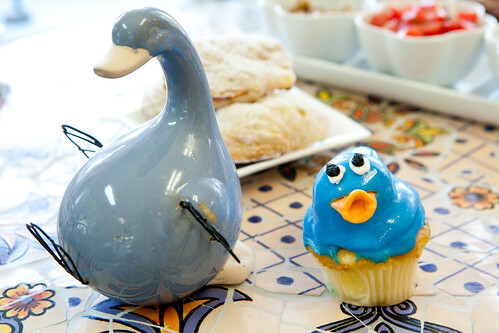 The most adorable was the blue duck cupcake. It was moist and tasty yellow cake and the frosting was mostly vanilla with a pocket of cake crumbs and cinnamon sugar where the duck shape is. (I expected it to have a bit more frosting on that cupcake to create that duck so it’s not a big deal to me). 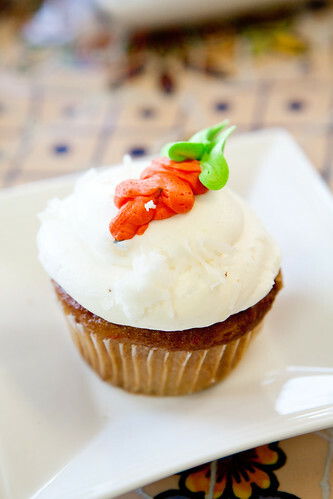 The carrot cupcake was very moist and contained with a lot of carrots and raisins (rather than cake a little bit of the latter) and the cream cheese frosting was pleasantly tart. I ended up hauling a bunch of cookies and bread on the way home. The cookies were good, basic sugar cookies. The bread (I had Pugliese, pumpernickel rye, sauerkraut rye and Pane rustica) is their forte and the enjoyed exponentially more than the former. 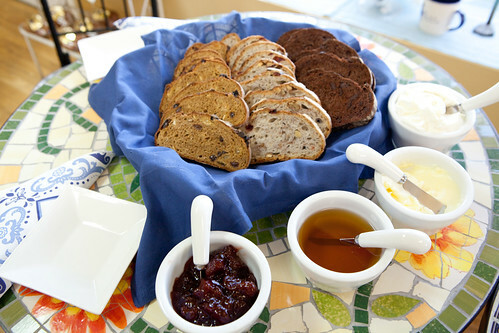 All had amazing crusts, tender crumb and flavorful. For me, the sauerkraut rye made the most interesting tuna fish sandwich I ever had. 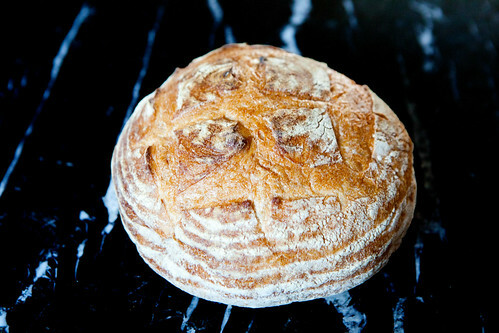 The pane rustica and Pugliese were wonderful versatile breads and were great with anything. 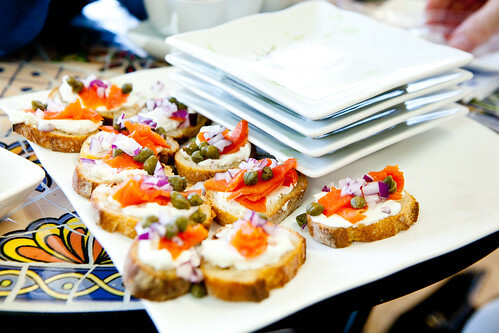 The pumpernickel rye made an awesome smoked salmon with cream cheese sandwiches. 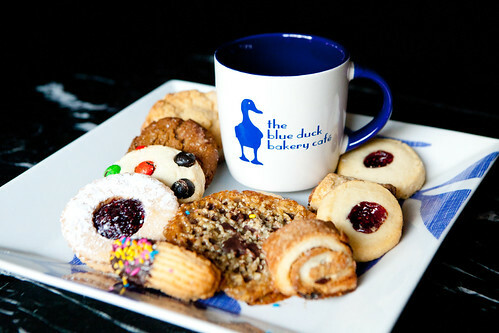 Truly, Blue Duck is my carb heaven.